Home blog Gardner’s Multiple Intelligences: What Are They, and Why Do They Matter? IQ testing and intelligence are often thought of as one in the same. Your score on an IQ test demonstrates your intellectual potential, however, over the past several decades, many other views of intelligence have been proposed, including Howard Gardner’s multiple intelligences theory. For marketers and brands, understanding Gardner’s multiple intelligences theory is key to communicating with customers. Gardner reveals in the book that to truly understand the full talents and abilities of people, it’s pertinent not to limit them by a single intellectual capacity but to rather categorize them among multiple intelligences. He also goes on to say that while a person might have one intelligence area that he or she is particularly strong in, there’s a good chance the person is strong in other intelligence categories, as well. Also, as part of Gardner’s theory, he argues that it’s not how the information reaches our brain, but what matters is what our brain does with the information once it is received. 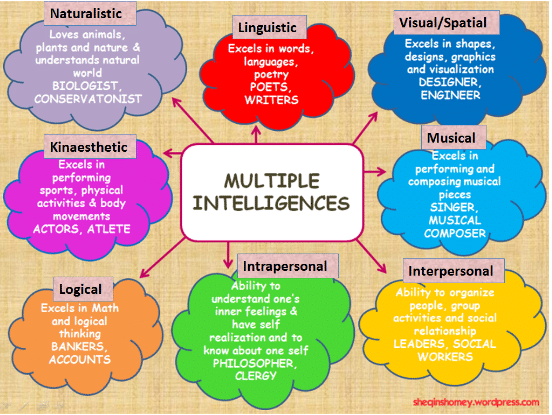 What Are the Gardner’s Multiple Intelligences? Those with strong musical-rhythmic intelligence are really good at pinpointing patterns, especially among different types of sound. They often think in patterns and rhythms and tend to excel in musical composition and have the ability to play musical instruments really well. They also have a superior capability to remember songs and melodies. People with strong visual-spatial intelligence are excel in visualizing. They tend to have a good sense of direction and will likely succeed in marketing because of their ability to bring life to marketing messages through the use of visuals. Let’s say your brand conducts market research on the ways your customers use your product. A person with strong visual-spatial intelligence can take your market research and use it to build an effective infographic. Those with this type of intelligence tend to enjoy writing and reading and are good at putting puzzles together. They also excel in simplifing complex information. A person with strong linguistic-verbal intelligence has prominent writing and reading skills. They tend to use fancy words when writing and speaking and are really good at memorizing information, which makes perform well when taking tests. If you have strong linguistic-verbal intelligence, you’re probably good at debating because of your ability to give persuasive speeches. Your persuasiveness capabilities along with your proficiency in explaining things really well would make you a great marketer or lawyer. Those with strong bodily-kinesthetic intelligence are really good at physical activity because of their enhanced physical control capabilities. They usually have a passion for dancing and sports. They also tend to be hands-on and enjoy creating things. As far as memory recall, those with this intelligence tend to learn better by doing rather than hearing or seeing. If you empathize and relate with others really well, then you probably have strong interpersonal intelligence. You’re most likely really skilled at nonverbal communications, and you do well with understanding the intentions of those around you. Counselors, salespeople, politicians, and philosophers usually have strong interpersonal intelligence. Those with strong intrapersonal intelligence do a lot of self-reflecting. They are extremely aware of their emotional state as well as what motivates them to behave the way they do. 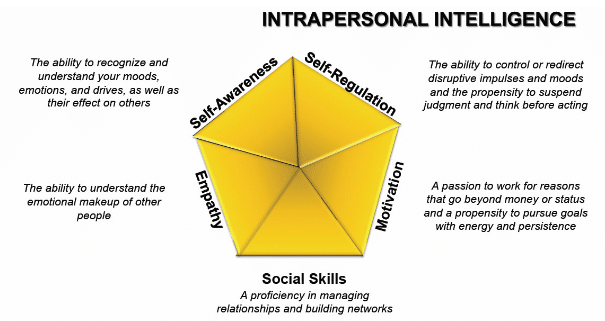 Characteristics of those with strong intrapersonal intelligence include daydreaming, assessing personal strengths, exploring theories, and always having a good understanding of why they feel a certain way. Gardner’s multiple intelligences theory didn’t always include naturalistic intelligence. This intelligence category has endured much resistance from others. Those with strong naturalistic intelligence are said to be incredibly in tune with their surroundings and like exploring nature. They notice even the smallest of changes in their environment and have no desire to study topics that don’t relate to nature or what is going on around them. Over the years, Gardner’s multiple intelligences theory has become prized by many teachers, many of whom have made the intelligences synonymous with learning styles. Important to note, however, is that multiple intelligences are not learning styles. Understanding Gardner’s multiple intelligences theory proves beneficial for a number of reasons. Imagine as a marketer that you analyze your buyer persona and determine the majority of your customers have strong visual-spatial intelligence. Knowing this allows you to refine your marketing efforts accordingly. Instead of posting lengthy blog posts on certain topics, your audience would much rather look at an infographic or watch an explainer video covering the same information. If you discover the majority of your audience has strong naturalistic intelligence, then you know to position your marketing messages with an environmental angle. Let’s say you sell accounting software. To effectively connect with your audience, you could create marketing materials on the various ways accounting software reduces paper waste and how to go paperless. Studying the theory of multiple intelligences is also important for business leaders for a number of reasons. It not only increases productivity within the work place by better communicating with employees, but it can also be used to better communicate your marketing message with your audience. 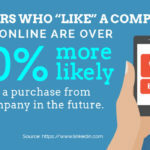 Connecting with your audience in a way that leads to higher conversions starts with understanding how they think and behave. Use our guide on the Gardner’s multiple intelligences theory to improve your visual marketing efforts. And don’t hesitate to reach out to us for help with using Gardner’s theory to boost your marketing efforts. As a visual marketing agency, we excel in helping brands connect with their customers based on their preferred marketing mediums.